People see flowers as serene and restful because they forget they are the products of vicious evolutionary battles too, but every day these flowers have to fight for survival, even with my help. Everything we admire about them is a weapon of defense or reproduction. Colors to warn away the wrong visitors, or to attract the right ones, toxins or a bitter taste to keep enemies away, but which also allow the plants to live because another creature finds the unique taste delicious, and takes some pollen with it when it goes. They develop scent to lure in the birds and the bees. All that scent and color and taste, it’s all to keep them alive, to draw in what they need. They are more than just something pretty, although they are that too. Flowers are survivors. I’m seeing references to flowers and gardens a lot these days — in the book I just finished reading (quoted above), in the image below, in friends’ online requests for seed catalogues. I think perhaps the Universe is urging me not to forget that there’s always more — more beauty, more power, more strength, more activity, more complexity — than what meets the eye. Recently some among us have celebrated Imbolc, which — to oversimplify — marks the midpoint between the winter solstice and the spring equinox. We are closer to the end of winter than to its beginning. And while there’s likely much cold weather still to come in the next month or two, we are definitely well on our way to spring and the new (visible) life that it brings. 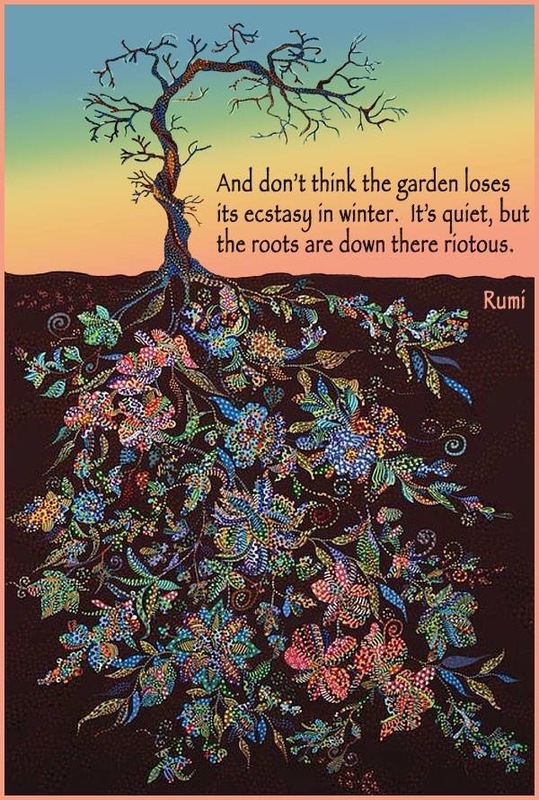 But also, as the poet Rumi reminds us, “Don’t think the garden loses its ecstasy in winter. It’s quiet, but the roots are down there riotous.” There is much activity where our eyes cannot see. The surface is shallow. And nothing and nobody is just one thing. It’s true for each of us, and for each person we meet. One may seem quiet even when their roots are riotous. And as the flowers are “more than just something pretty”, each of us is so much more than what the average observer can see. Today I celebrate our individual and collective complexity, and all the strength and beauty it brings.